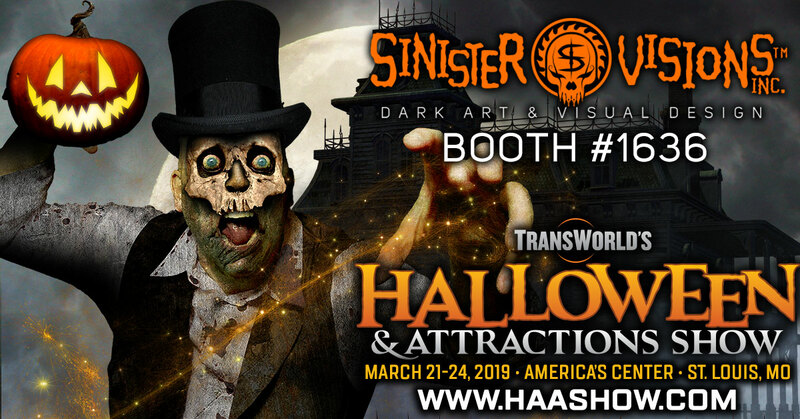 Sinister Visions News and Updates: Get 20% OFF at ShopSinister.com and TransWorld's Halloween & Attractions Show in St. Louis! ShopSinister.com is running a two-pronged promotion leading up to / during TransWorld's Halloween & Attractions Show, March 21-24 in St. Louis! FIRST! Get 20% OFF any purchase of $20 or more from now through the end of February at http://www.shopsinister.com with coupon code TRANSWORLD. Go grab yourself something snazzy and spooky, and if it's a shirt, be sure to wear it to the HAA Show. Why? *I have to be in the booth to give the discount - I'm the only one that knows ALL the shirts I've designed over the last 20+ years!